Cities around the world look to London for best practices and the latest strategies for promoting continued economic and community growth. While public art has not traditionally been seen as creating economic and social benefits, it should be. Cities like London are proving that investing in arts and culture is an effective tactic to boost tourism, engage citizens in new ways, and strengthen cities. It is our hope that the success of arts and cultural celebrations like Lumiere London will inspire cities worldwide to host exceptional public art and their own cultural events. Public art not only contributes to a city’s economy, identity, and quality of life, but it also brings people together through shared experiences. Its ability to promote both social cohesion and economic growth is a big reason Mike Bloomberg supported major public works while mayor of New York City, and it’s why public art is a focus of Bloomberg Philanthropies. Through public art installations, we have seen time and again how art can transform urban places. A great example is Christo and Jeanne-Claude’s The Gates, which opened in February 2005. For 16 days, more than 4 million New Yorkers and visitors from around the world came to see the 7,503 gates along 23 miles of pathways through Central Park. Not only did the memorable installation spark a buzz that continues to this day, it generated an economic impact of over $254 million, and as much as a 300% increase for local businesses and cultural institutions during the exhibit. 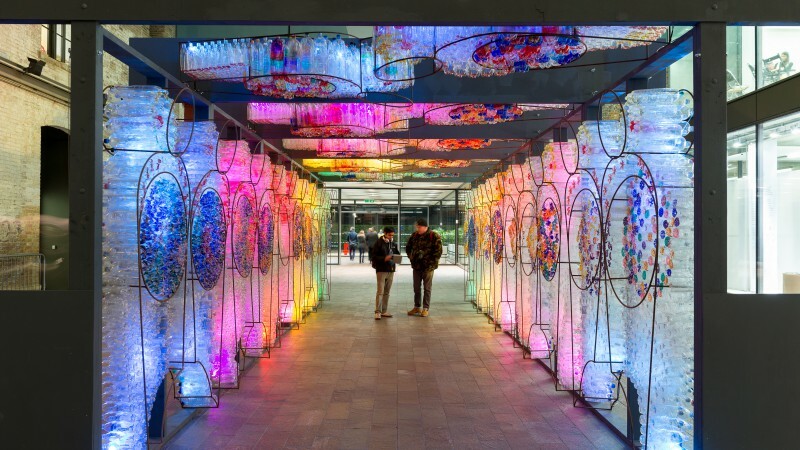 Public art’s positive impact on communities and cities is undeniable, which is why Bloomberg Philanthropies remains committed to supporting innovative exhibitions. In recent years, we’ve supported major installations such as Doug and Mike Starn’s Big Bambú in Jerusalem, which attracted more than 85,000 visitors, Tobias Rehberger’s Dazzle Ship in London, seen by more than 16.5 million people, and Olafur Eliasson’s Ice Watch in Paris, an installation that became an international symbol of the monumental global agreement to reduce carbon emissions as part of the historic COP21. Building on our belief in the transformative power of public art, we launched the Public Art Challenge last year. The Challenge invited U.S. mayors to compete for up to $1 million to develop temporary public art projects that celebrate creativity, enhance urban identity, encourage public-private partnerships, and drive economic development. Four cities were selected, and each is bringing together government agencies, artists and citizens to create public art projects that tackle a specific community issue, including housing vacancy, civic identity, water conservation, and neighborhood safety. This initiative really speaks to the role of artists as drivers of creative solutions. We look forward to seeing these projects develop over the next few months, and know they’re going to make a lasting difference. We are proud to partner with Artichoke and the Mayor of London in making Lumiere London possible, and we’re excited to see the kind of vitality and energy that the festival is going to bring to the city over the next few days. To visit the festival’s new works, download the program map here.